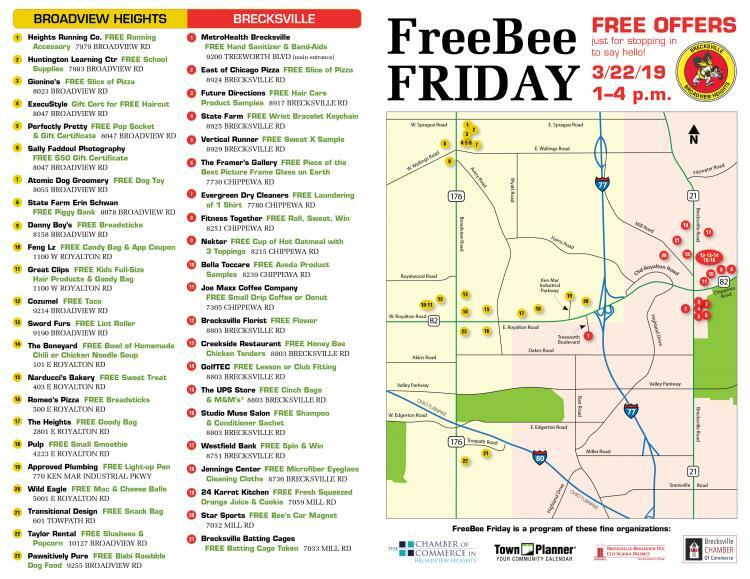 FreeBee Friday is the Business Showcase Tour you have been waiting for. It is also known as the Brecksville and Broadview Heights Treasure Hunt because there is loads of Free Goodies including HoneyBee Chicken Tenders, Tacos, Pizza, Bread Sticks, Mac n Cheese Balls, Smoothies, Cookies, Oatmeal (yes oatmeal), Coffee, Slushies, Lint Rollers, School Supplies, Hair Care Products, Free Haircuts, Batting Cage use, etc, etc.....and it is all FREE from 1-4 pm on March 22nd when the Bees are off school....Have Fun!!! All invited!! Just download our map or pick one up at any of the participating merchants and stop in and say hello to these fine local merchants. Tickets not necessary to take the tour.